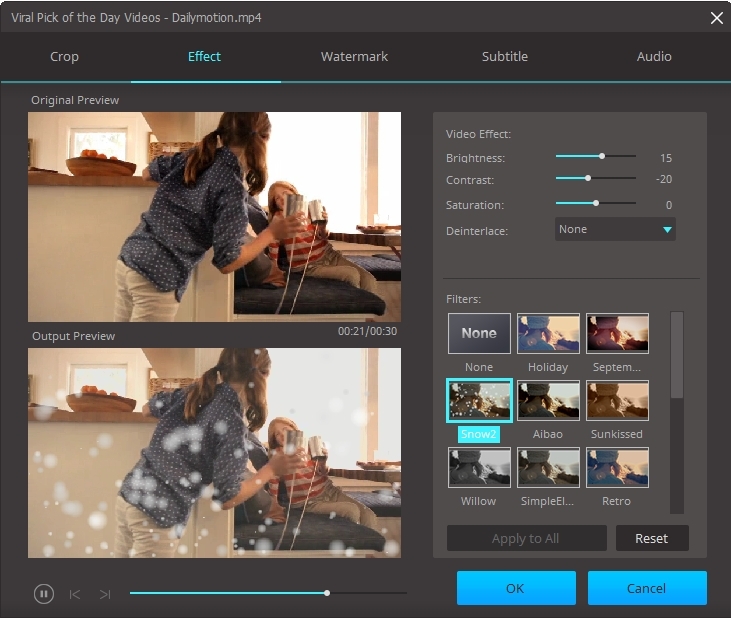 Aimersoft Video Converter Ultimate is also a great video editing tool. 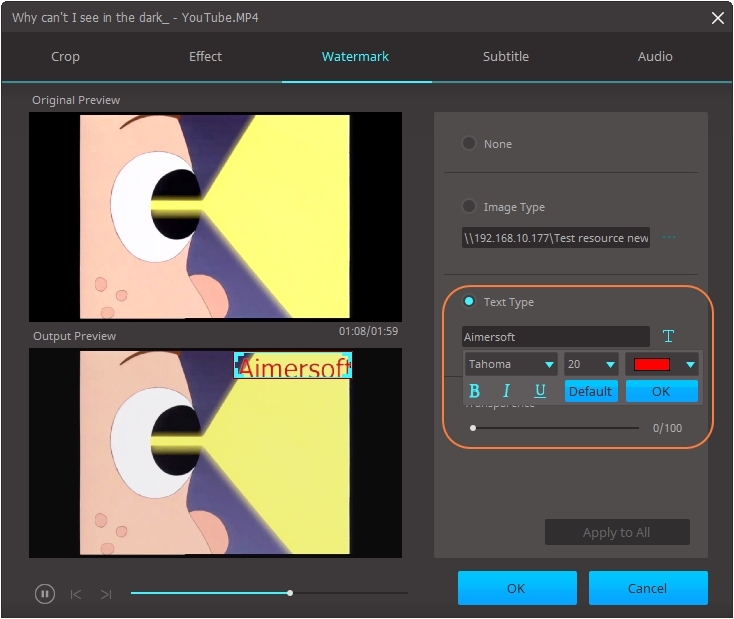 With it, you can enhance your video by trimming, cropping video, adding effects, watermark, subtitles to the video, and do more. Learn how to edit video easily below. Install and open Aimersoft Video Converter Ultimate on your Windows PC or Mac. Add video to it. 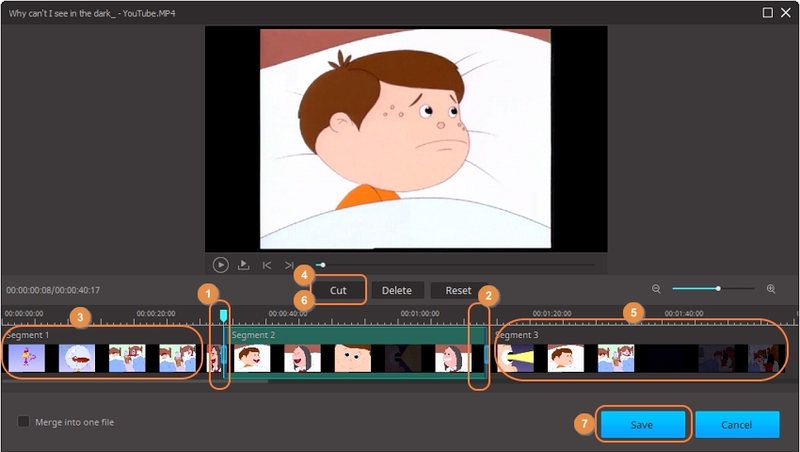 Below the video thumbnail, there are 3 video editing icons. To trim video, please click on the first icon. Situation 1: From the trimming window, move your mouse to the point you want to cut on the time slider. Then click on the Cut button. The video will be cut into 2 parts accordingly. Click on the unwanted part, and click on the Delete button. Click Save to get the video section that you cut. Situation 2: If you want to extract a certain section of in the middle of the video, respectively move mouse to the beginning and end of the wanted section and click Cut. Thus, the whole video is divided into 3 parts. Click on the unwanted 2 parts and hit on the Delete button. Your wanted section will be left only (Like Segment 2 in the image below). Finally, click on the Save button. Situation 3: If you want to trim a long video into several small clips, this video trimmer can also help you do it. Simply move the mouse to the point you want to trim on the time slider, and click on the Cut button. Then click Save to exit the trimming window. After clicking the Save button, choose an output format and click on Convert All. It will export the video clips and save them on your computer. You can click the Converted tab to check them. Open Aimersoft Video Converter Ultimate and add videos to it. From 3 editing icons, choose the second one to get into the cropping window. Drag the corner of the video frame to crop the video. You can preview the output video from the window below. Alternatively, you can adjust the size from the right panel to get a fixed frame. When it’s done, click OK to exit the Cropping window. 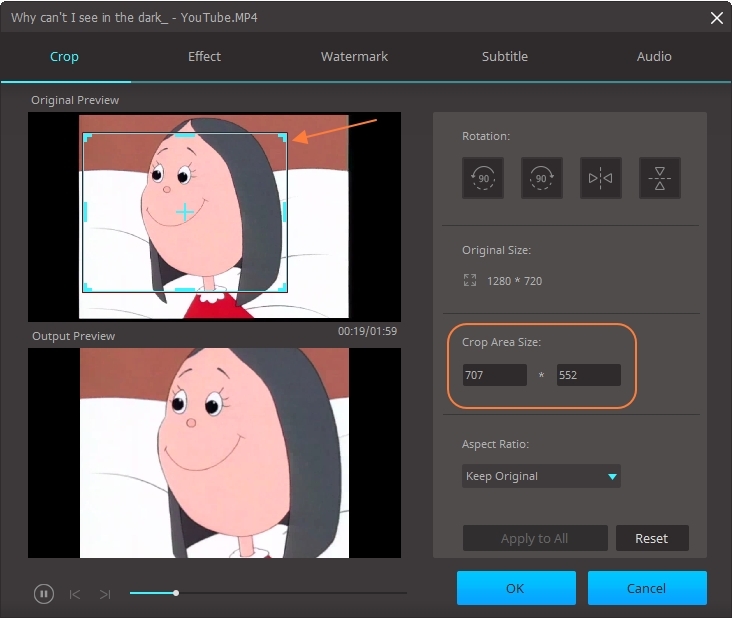 Additionally, in the cropping window, you can rotate your video or set the video ratio. There are 4 directions to rotate the video. Choose the one you want and preview in the lower window. Select an Aspect Ratio and click on OK to exit. 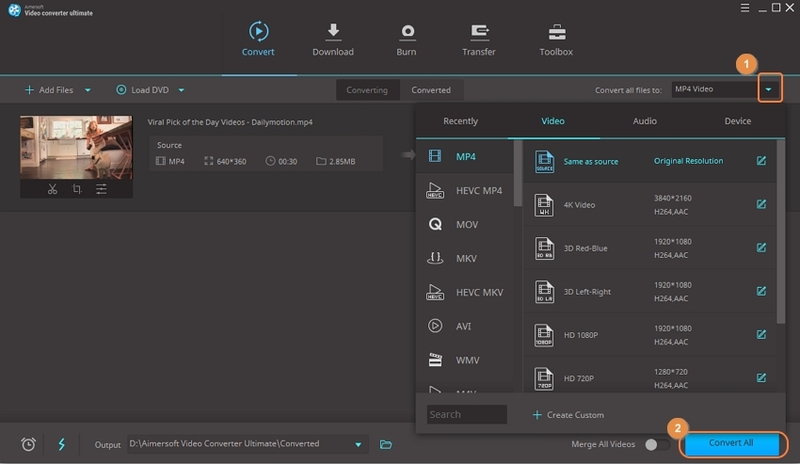 Click Convert all files to option to choose an output format for your edited video. Finally click on the Convert All button. Find the edited videos from the Converted tab. Open Aimersoft Video Converter Ultimate and add video file to it. 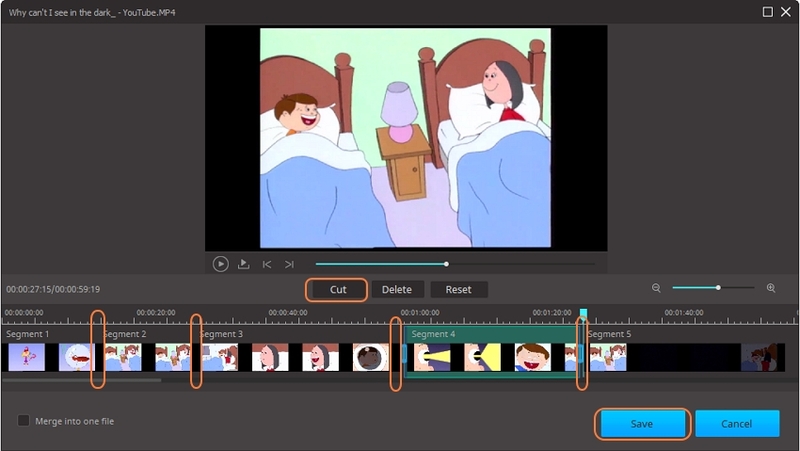 Below the video thumbnail, please select the second video editing icon to enter the editing window. From the editing window, click the Effect tab. Now you can adjust the video effects including Brightness, Contrast, Saturation, and De-interlace. And on the Filters section, you can click each filter to apply to your video. Preview it on the left lower window. Finally, click on the OK button. 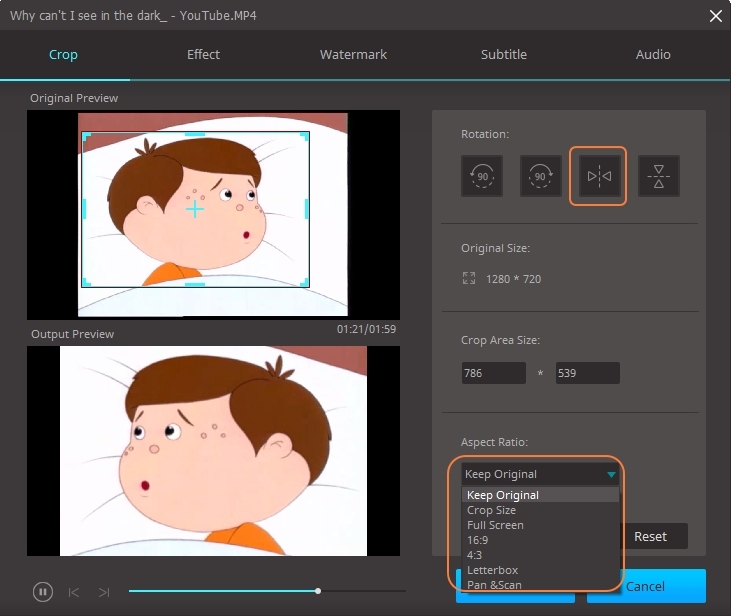 Return to the main windows of Aimersoft Video Converter Ultimate, choose an output format and click on the Convert All button to export the edited video. 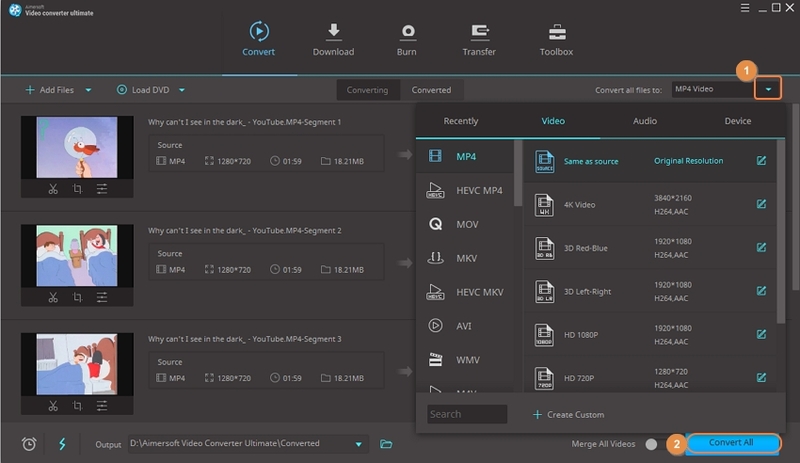 Add video files to Aimersoft Video Converter Ultimate. Then choose the second editing icon to get to the Watermark window. In the pop-up window, choose the Watermark tab. 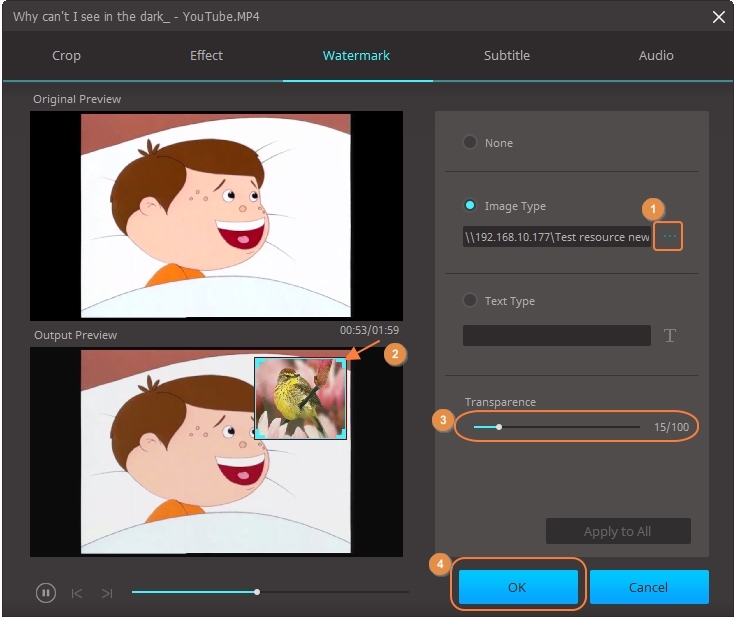 From there, you can add the image watermark or text watermark to your video. If you want to add the image watermark, click “…” to browse an image on your computer. You can adjust the image size and place it to the video. Also, you can change the transparence by dragging the Transparence bar. If you want to add text watermark, choose it and type the text to the blank. Click T to adjust the text font, color, size, and style. Also, you can move the text watermark to anywhere in the video and change the transparence. Finally, click on the OK button. 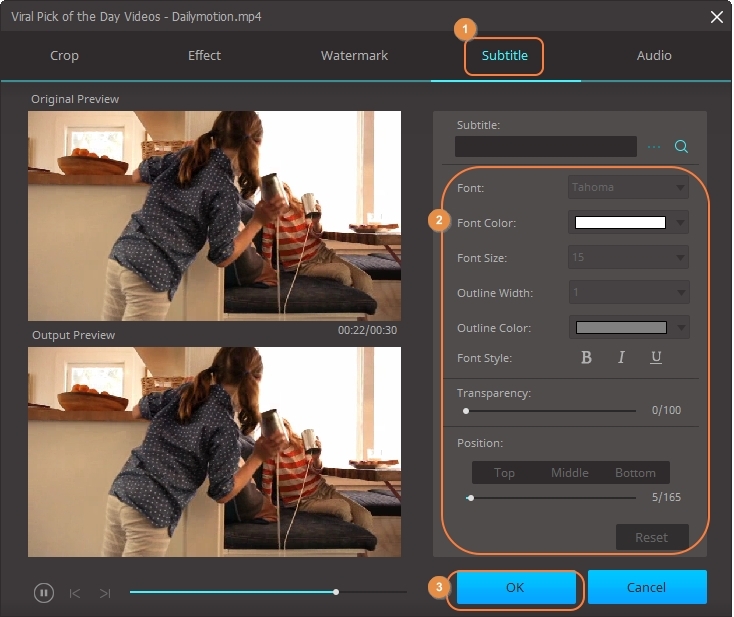 Lastly, choose an output format and hit on the Convert All button to export the edited video with watermark. 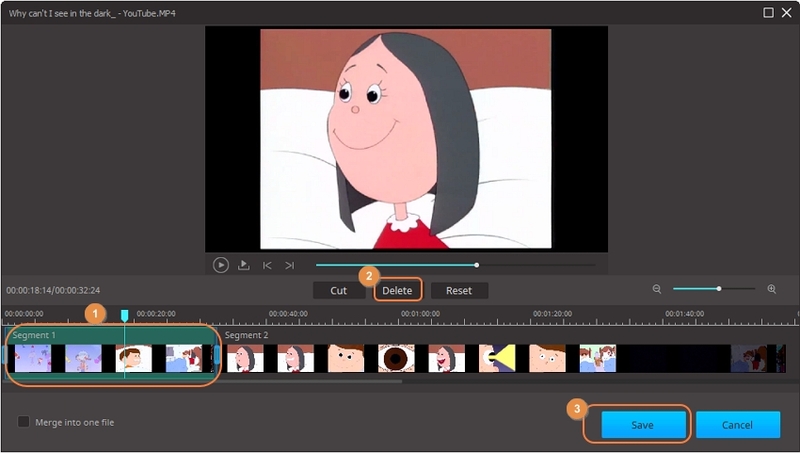 Add video to Aimersoft Video Converter Ultimate and there will be 3 editing icons below the video thumbnail. Click the second icon to enter the Subtitle window. Now switch to the Subtitle tab. Click the “…” icon to load the subtitle file from your computer. If you don't have subtitles, you can click on the Search icon to get subtitles online. Then set the subtitle font, color, size, transparency, and more to your preference. Finally, click on OK. Finally, choose an output format from the Convert all files to option. And click on the Convert All button to save all of the changes. After that, you can find your edited video with subtitles from the Converted tab.